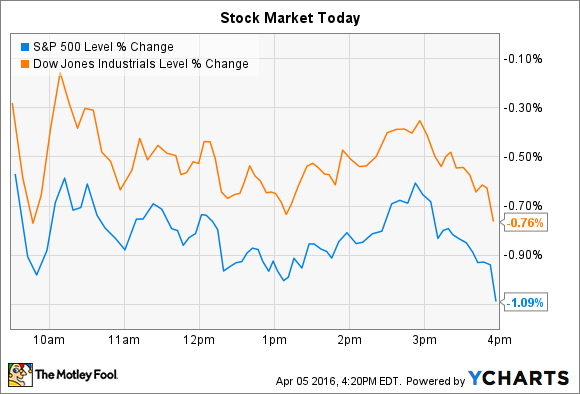 Why these two stocks rose even as the broader market declined. Stocks never broke into positive territory on Tuesday and sold off in the final hour of trading to end up at session lows. By the closing bell, the Dow Jones Industrial Average (DJINDICES:^DJI) had lost 133 points, or 0.8%, and the S&P 500 (SNPINDEX:^GSPC) shed 21 points, or 1.1%. Two reports on Tuesday morning showed continued steady growth in the economy. The Markit Purchasing Managers Index found that the service sector rebounded in March following a decline the prior month and the latest Institute for Supply Management report showed that growth in non-manufacturing businesses accelerated last month. Both readings came in slightly stronger than expected. Meanwhile, Pfizer (NYSE:PFE) and Marvell Technology (NASDAQ:MRVL) each made notable moves higher on Tuesday even as the broader market declined. Drug giant Pfizer notched the Dow's biggest daily gain, rising 2% on almost six times its average trading volume (an amazing 271 million shares traded hands over the course of the day). The surge came after the U.S. Treasury Department issued new rules regarding corporate tax inversions that effectively removed a key financial justification for Pfizer's $160 billion merger with Ireland-based Allergen, whose stock dove 15% on Tuesday. The regulations now in place make it harder for companies to lower their tax liability by changing their residency to outside of the U.S. "Today, we are announcing additional actions to further rein in inversions," Treasury Secretary Jacob Lew said in a press release. In their own joint press statement, Pfizer and Allergen said the two companies are "conducting a review" of the new tax regulations. "We won't speculate on any potential impact," they explained to investors, "prior to completing the review." But Reuters, citing an inside source, reported that Pfizer is "leaning toward abandoning" its merger agreement rather than trying to adjust the terms so that they might fit under the new guidelines. In any case, Wall Street is betting that Pfizer's business will do better on its own, sending shares higher as the gigantic merger prospects declined. Marvell Technology's shares soared 13% after the company announced a big shakeup of its management team. The information technology giant's CEO, Sehat Sutardja, and President Weili Dai are stepping down from their positions, effective immediately. "The board [of directors] believes that the time has come to move in a new leadership direction," executives explained in a press release. The move comes as Marvell is still searching for a replacement Chief Financial Officer in the wake of accounting issues that delayed the filing of its latest 10-K annual report. That restatement is expected to include an amended filing of at least two quarterly reports from fiscal 2016, and the company reiterated on Tuesday that it would make the filing "as soon as practicable." Despite the uncertainty surrounding its accounting procedures -- and its management team -- investors reacted positively to the news that Marvell is making a break from its recent past. The board of directors didn't provide any detail as to what type of leadership shareholders can expect going forward, except to say that its "highest priority is to leverage Marvell's strong core business and technology to drive the next stage of product innovation and profitable growth."